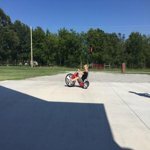 Introducing Radio Flyer’s Big Flyer Sport&reg;! 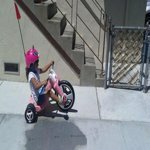 This is the performance trike designed to be your child’s favorite new ride. The Big Flyer Sport&reg; is a chopper style tricycle with sleek racing design. It features a large, direct drive 16” front wheel that can be pedaled both forwards and backwards. It also features an adjustable seat that will grow with your child. It comes complete with chrome handlebars and a removable racing pennant for added visibility and safety. Maximum weight capacity 65 lbs. For ages 3-7 years. 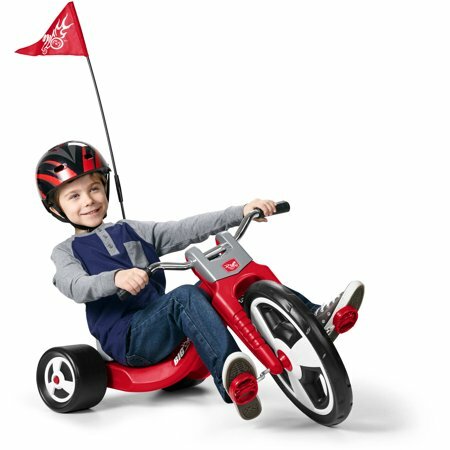 Introducing Radio Flyer’s Big Flyer Sport®! 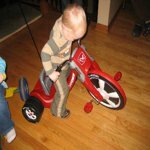 This is the performance trike designed to be your child’s favorite new ride. The Big Flyer Sport® is a chopper style tricycle with sleek racing design. It features a large, direct drive 16” front wheel that can be pedaled both forwards and backwards. It also features an adjustable seat that will grow with your child. It comes complete with chrome handlebars and a removable racing pennant for added visibility and safety. Maximum weight capacity 65 lbs. For ages 3-7 years. Maximum weight capacity 65 lbs. This toy will last is a long time as he grows into it. I like how it is low to the ground in case he falls. He loves playing with it. We bought both our children his and her big wheels. 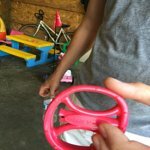 We love Radio Flyer products and this one did not disappoint! I put it together myself but I'm sure it would have taken my husband much less time. It was a huge hit with my 3 year old granddaughter. 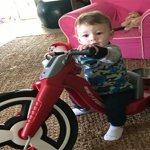 Our 2 year old grandson is a little small for this bike. The price is great too. Got this for our 4 year olds birthday. He can barely reach the pedals with the seat in the closest position. He loves it! Would he great for 4-6 year olds. Be aware if you try to buy this for someone younger. I wanted to buy my daughter a big wheel but wanted a better color so purchased this one instead. It was a little more expensive but I love it. It was easy to put together (30 minutes probably). Also the handle bars and pedal bars are medal which is a plus. I liked the neutral color the best. I previously purchased 2 other radio flyer products, a wagon, and tricycle, and both have held up well with my now 2 and 1/2 year old! Great product. Bought this for my 4 year old grandson and he tells me everyday , " Grandma I love my trike!" That's good enough for me! Assembly wasn't complicated and it seems sturdy and of good quality. My grandson is very tall for his age and I see him riding this for a long time!! I had one of these when I was a kid.It was amazing and a wonderful surprise when I found it one Jet.I bought them for my grandaughters and they love racing down the driveway. Thank you jet. I picked up and put this trike together today. Very easy step by step instructions. Quality seems much better then other brands I have looked at. My daughter rode it for 3 hours straight and didn't want to come in. I am so far very happy with my choice of "big wheel". Price was much cheaper then other sellers of this trike. Glad I did my research. Seems to be a little better than a "Big Wheel". Bought this as a birthday gift for my 3 yr old grandson. It seems to be a bit sturdier than the original Big Wheel but it still is all plastic wheels. The next step up would be better because of a rubber strip on the front wheel. This was less expensive than the Big Wheel, that's why I bought it. But I also wish I had bought the one with the rubber strip! Turns out my grandson's legs are too short to reach the pedals anyway. Pedal keeps falling off on left side. The mold for the snap on connector wasn't correct so it won't snap on and lock into place. Other than this problem I'm sure the bike would be fun if it could be ridden. I read reviews for this item and several indicated the box arrived missing parts. Figuring it was a fluke, I ordered one anyway. Sure enough, it arrived missing a major component: the wheel! Hoping for better quality control on my replacement shipment!